Learn about easy and proven techniques to help you get happy, get fit and healthy! With lots of negative influences around us, it's easy to get 'down in the dumps' and to forget just how much we have going for us. In addition, negative thinking and behaviour depresses our immune system, thus compromising our health and our ability to achieve the goals we dream of. Developing a PMA is not just 'pink and fluffy' nonsense. True positive thinking helps you see the opportunity in even the most challenging circumstances, improves your chances of recovery from serious illness and makes your feel much happier about exactly where you are (wherever you are) today. There are two ways of approaching life - from a position of fear or a position of love and joy. What affects our approach include genetics, character types, learned and conditioned behaviour and other external behaviour. 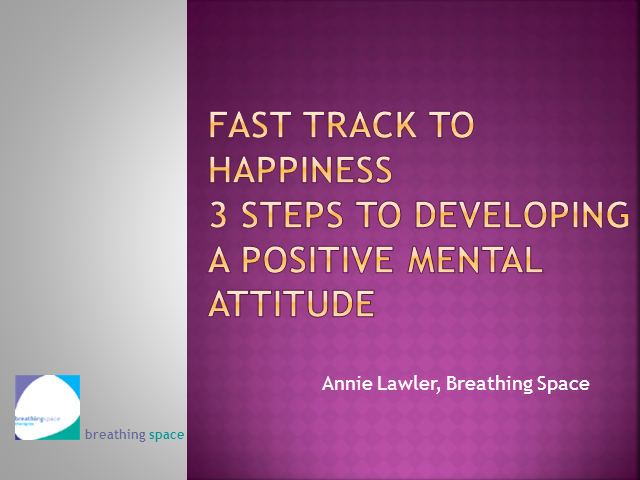 There is a great deal that can be done however to overcome anxiety, fears & phobias and Annie Lawler, talks in this webcast about the proven techniques she used to change her life into a more positive, less fearful, more joyous experience. Sign up today to join in the debate! Do you lay awake at night, unable to sleep and tossing ideas, thoughts and worries around in your head? Of course, we all have the odd disturbed night, but when it becomes regular, lack of sleep affects our moods, our ability to perform and enjoy life AND our immune system. It's time to break the cycle, using proven techniques, broken down into easy steps that anybody can do. Join this vital webcast today and start to see the rapid results. We all know that what we eat & drink eventually turns into tissue and becomes part of our bodies,. We also know that regular activity tones the body, burns calories and aids heart health. But did you know, they also affect your mental and emotional wellbeing, your ability to concentrate and make decisions? This webcast gives you 10 easy ways to adapt your eating & activity habits to reduce stress, improve health, performance and happiness. Don't miss it! This step by step guide to stress-free living, gives you easy-to-use, proven techniques that EVERYONE can fit into their schedule and which work fast! If you're feeling tired, overwhelmed by the commitments in your life or simply feel there's got to be more to life than this, then this Webcast is for you. Learn easy steps to Stress Free Living and learn to love your life. These days, we’re encouraged to be on the go 24/7 and the pace at which we lead life is amazing. This situation has been encouraged in our society in numerous ways. Our focus is often on money and material possessions, but as our standards of living are increasing, we are tied into greater debt to support it and this can become more of a millstone than an asset. In short, modern culture encourages us to be Superhuman and because of this, we are influenced to set ourselves impossible targets. When we fail to reach these, we become dissatisfied, unhappy and self-critical. The concept of Super-Humanity is to free ourselves of the need to be Superhuman, starting with unconditional acceptance of ourselves, those around us and our world. One of the key words is 'BALANCE'. As a culture at the moment, I believe we’re out of it, in more ways than one!! This Webcast is your introduction to creating greater calm, focus and confidence in your life so that you can create the life and happiness you seek. Soul2Soul Coach & Stress Management Specialist, Annie Lawler offers proven tips and techniques on creating calm and focus in your life and supreme confidence in yourself so that you can find the right balance for you and be all that you might be. In doing this, you create a happier, more fulfilling life in every way - and you have more FUN! If you are outwardly confident, successful and capable, yet often feel overwhelmed and out of control and feel you have little time for yourself or if you feel somehow unworthy, undeserving or not good enough. You're not alone. Almost all the people who visit me in my private practice are in a similar position and this Channel gives you proven techniques, strategies and tips on to how you can turn your life around so that you feel good about yourself, those around you and your environment. Each month I'll be offering a free webcast which gives you an introduction to the proven techniques which transform my clients lives..